Shannon lives in the Victorian seaport of Port Townsend, WA, where she currently has a teaching and healing practice that serves her local community, as well as national and international clients. She also contracts as a Comfort Therapist with both Assured Hospice and Hospice of Jefferson Healthcare. Shannon offers private sessions, classes, personal and group retreats. 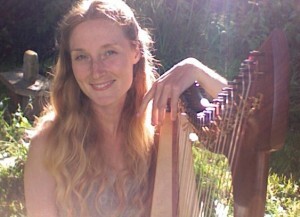 She also offers medicinal music, celtic harp, and sacred chant concerts throughout the Pacific Northwest both as a soloist and in the duo Evenstar. *Devoted yoga practitioner since 1996. Studied with many teachers, my most influential being Sofia Diaz. *Have developed, sustained, and deepened a daily yoga sadhana practice that continues to serve as a foundation for every living day.